I love a good thriller, mystery, suspense, or crime novel, and I'm not too picky about subgenres. I'll take a fun cozy mystery, a creepy domestic thriller, or an intense suspense novel. Once I've settled into a comfy chair and opened to the first page, I'm ready for an afternoon of escape reading. 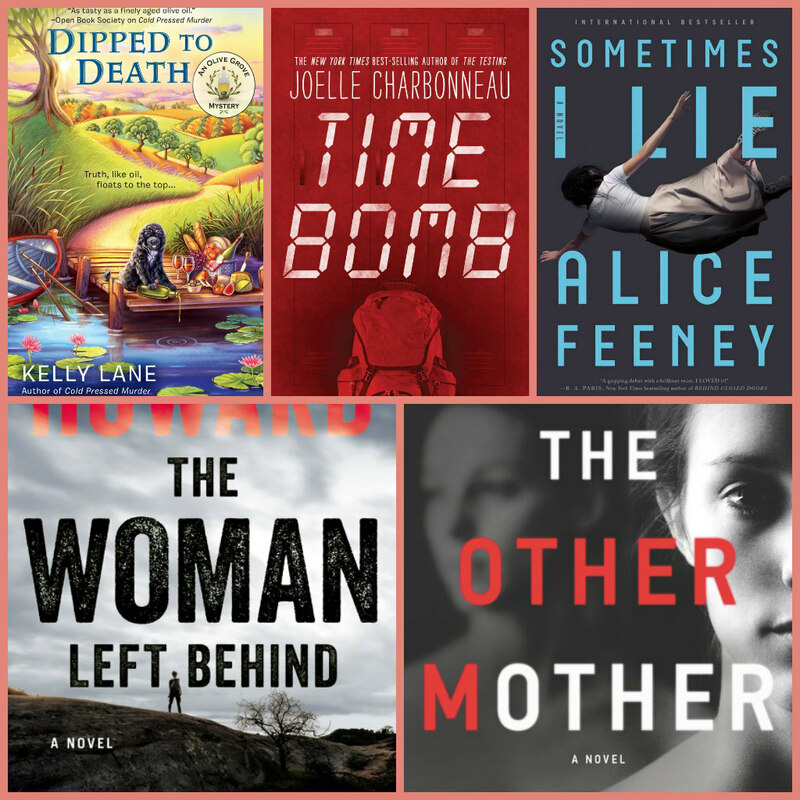 Here are 10 good thriller/mysteries, all written by women and all new this month. The Broken Girls by Simone St. James (Berkley, March 20; supernatural thriller): Murder, ghosts, and secrets that won't rest are all connected to an event that took place at a boarding school for unruly and unwanted girls. Set in Vermont. Opening lines: "The sun vanished below the horizon as the girl crested the rise of Old Barrons Road. Night, and she still had three miles to go." 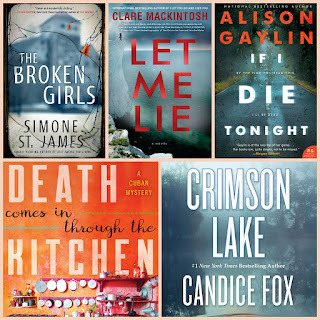 Let Me Lie by Clare Mackintosh (Berkley, March 13; psychological thriller): A new mother feels the loss of her parents, whose deaths were considered suicide. As she digs into her family's past, she feels danger closing in. Set in East Sussex. Opening lines: "Death does not suit me. I wear it like a borrowed coat; it slips off my shoulders and trails in the dirt." If I Die Tonight by Alison Gaylin (William Morrow, March 6; suspense): A teen is accused of a carjacking and hit-and-run murder, but when the case hits social media the facts don't look that simple. Set in New York state. Opening lines: "By the time you read this, I'll be dead. This isn't Jackie. It's her son Wade." Death Comes in through the Kitchen by Teresa Dovalpage (Soho Crime, March 20; mystery/detective): After a Cuban food blogger is found dead in her bathtub, her fiancé--newly arrived in the country for the wedding--becomes the prime suspect. Can he clear his name and find the true killer? Set in Havana. Opening line: "The Cuban customs officer lifted an eyebrow at the bridal gown--a white satin bodice with tulle appliques, sheer sleeves, and a two-foot train--and took a long, suspicious look at the couple." Crimson Lake by Candice Fox (Forge, March 6; suspense): A private investigator and ex-police detective meet in an isolated Australian community, each hiding from their past. In this first of a new series, the two team up to find a missing person. Set in Queensland. Opening lines: "I was having some seriously dark thoughts when I found Woman. The only company I'd had in a month was my gun, and they can start to talk to you after a while, guns, if you're alone with them long enough." Dipped to Death by Kelly Lane (Berkley, March 6; cozy mystery): Eva Knox is surprised when her ex-boyfriend shows up at her family's olive farm and inn, claiming he's in town to do some bird watching. After he's found dead in her pond, poisoned by olive oil, she must scramble to find the murderer and save her family's reputation. Set in rural Georgia. Opening lines: "Given the bizarreness of the night before, all in all, it'd been a pretty ho-hum September day in Abundance, Georgia. Right up until the moment Dolly and I spied that odd mop of brown stuff bobbing in the pond." Time Bomb by Joelle Charbonneau (HMH Books for Young Readers, March 13; thriller / suspense): A diverse group of six teens are trapped in their school after a series of bombs goes off. Their survival may depend on how well they can work together, especially when they learn the bomber is still inside the building. Opening lines: " 'Don't fight,' Cas said from the doorway that Frankie and Z had just disappeared through. Tears glistened in her eyes. 'Can we turn the radio back on? Maybe they'll tell us help is finally coming.' "
Sometimes I Lie by Alice Feeney (Flatiron, March 13; domestic thriller): A woman is in a coma, able to hear but unable to speak or move. She listens and thinks while her family talks, remembering her past and beginning to suspect that her husband might be a bad, bad man. Set in England. Opening lines: "My name is Amber Reynolds. There are three things you should know about me: 1. I'm in a coma. 2. My husband doesn't love me anymore. 3. Sometimes I lie." The Woman Left Behind by Linda Howard (William Morrow, March 6; romantic suspense): Can a woman with a military desk job and a high security clearance transform herself into a valuable member of a field-op team? Maybe with the help of the man who trained her. Set in Syria. Opening lines: "Congresswoman Joan Kingsley moved quietly through the deep night-shadows of her home, not turning on any lights because darkness suited her these days. She resented the sun for shining, people for laughing, the days for passing." The Other Mother by Carol Goodman (William Morrow, March 27; Gothic thriller): Taking her infant daughter and running from a controlling husband, a woman assumes a new identity and starts a job as an archivist in a remote mansion in the Catskills. A new friend, a decades-old mystery, a creepy mental asylum, and a bout of postpartum depression threaten to pull her under entirely. Opening lines: "She's crying again. I don't know why I say again. Sometimes it seems as if she's done nothing but cry since she was born. As if she'd come into this world with a grudge." I just saw this on Twitter, I am going to try and pick up. Rims on Lake for my Aussie book challenge. I like the sound of The Woman Left Behind too! Oooo! So many good new books to read! Thanks for the list! This the second time today I have heard good things about The Broken Girls. I guess it must be put on my TBR list. 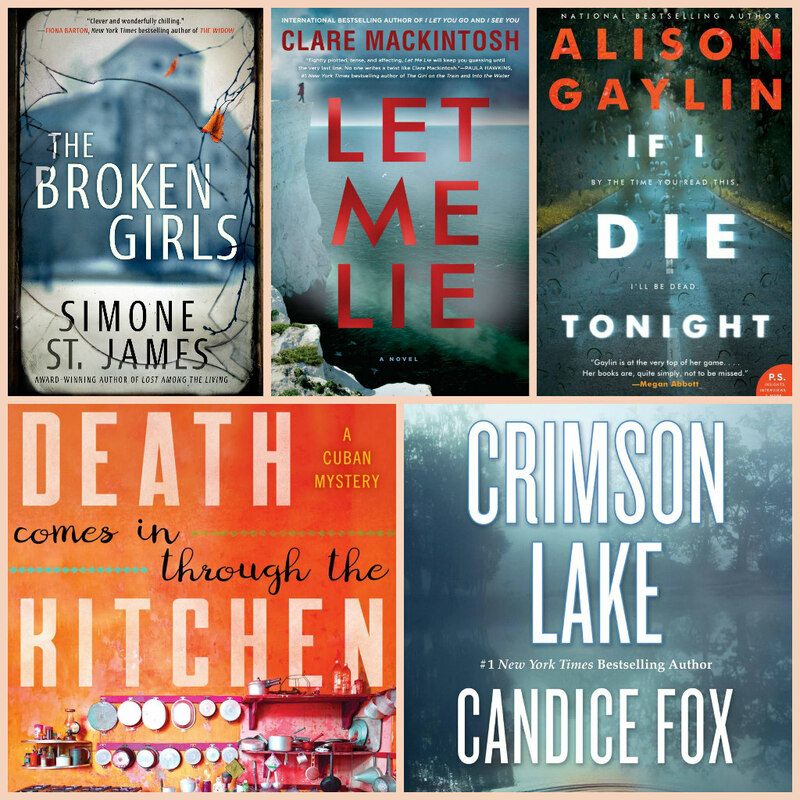 Women are killin' it in the thriller department these days. The Other Mother sounds really good to me. Half of these are already on my list - and I just finished The Broken Girls. Really liked it! So, I can recommend that one. 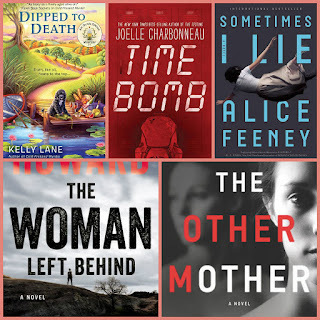 So many lovely thrillers! Let Me Lie looks like one I'd like, and I saw positive reviews for her last book so I've been wanting to try her stuff. Dipped to Death sounds fun (poisoned by olive oil? That's different!) and I love the opening of it. Same for Sometimes I Lie. lots of what sound to be good reads here .. thanks!